Last night we decided to go somewhere new to find a place for dinner, so we wandered over to a neighborhood a little southwest of our hotel. The area is supposed to be full of art galleries, bookstores, the University, and a variety of restaurants. The neighborhood is called the Spui. We walked along and passed a number of restaurants, not really seeing one that tempted us. Finally we found a Dutch restaurant called Haesje Claes (don't ask us what it means). 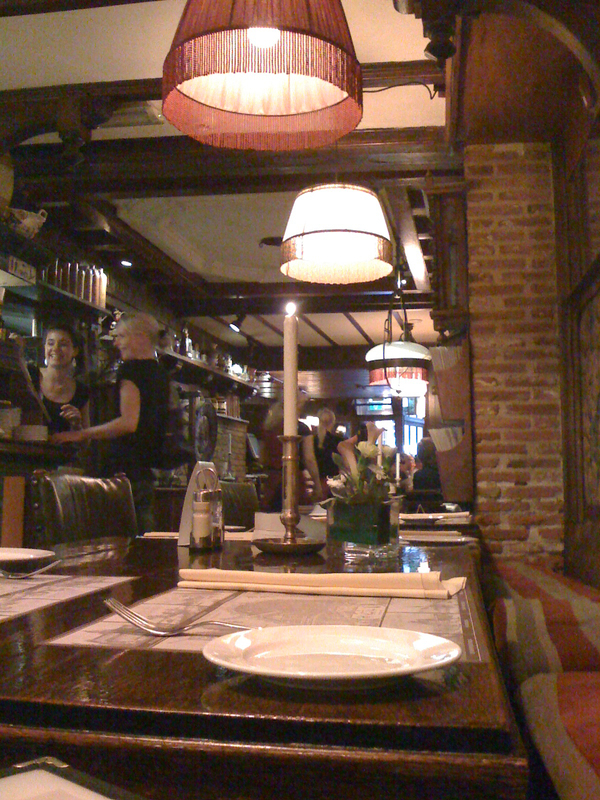 The restaurant was very attractively decorated with lots of wood paneled walls, half-timbered ceilings, looking like an old tavern or inn. We started with appetizers. Donnie had a terrine of asparagus, which was a slab of something like cream cheese with asparagus and other vegetables in it, served with salad and toast, and I had pickled herring, which was maybe the best I have ever had. For the main course, Donnie had steamed mussels with fries, and I had a special Dutch dish called Stamppot. It was a pile of mashed potatoes mixed with sauerkraut (which sounds terrible, but was delicious), along with a sausage, some boiled beef, and a meatball. It was very good, but very filling so I wasn't able to finish it. After dinner, we wandered around the Spui district, and found a free wifi spot near The American Bookstore, so I sent out the recent report and a few short emails from our iPhones. We then walked back to the hotel for some needed rest. On the way, we passed The Dam Plaza which was mobbed with tourists! The next morning (Thursday, July 30), we awoke to discover a bright blue sky. The forecast had been for rain all day. In fact, the forecast for the entire trip so far had been for rain, and we only ran into a light drizzle for a couple of hours in St. Petersburg while we were inside the Peterhof palace. The rest of the time, the weather has been wonderful. Thursday was mostly sunny, with some clouds. We had originally planned to use the rainy day to visit a museum or two, and do laundry (Donnie is a laundry bug! A week without doing laundry and she goes into a detergent frenzy. She likes clean clothes!). So instead, after promising to do laundry soon, and ignoring her twitching washing-machine-starting finger, we decided to take a trip out of town to some other villages or towns in the country. We asked our very helpful and friendly desk clerk for suggestions and he wrote a list of them for us..
We decided to go to the town of Volendam, which he said was accessed by bus. So we packed up our cameras, raincoats (just in case) transit passes, etc. and took a tram to the central station, and then found the correct bus #110. 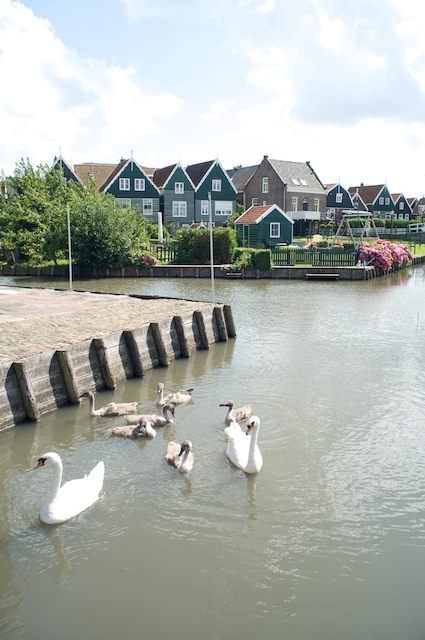 It was a half-hour bus ride to the town of Volendam, which is an old fishing village. It was a bit touristy, but still pretty and interesting to see. 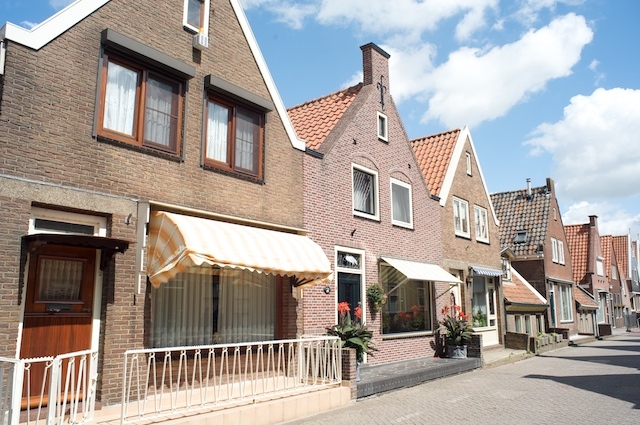 Our desk-clerk had also recommended the town of Marken, which is another fishing village nearby, but is on an island, so we took a boat to Marken. 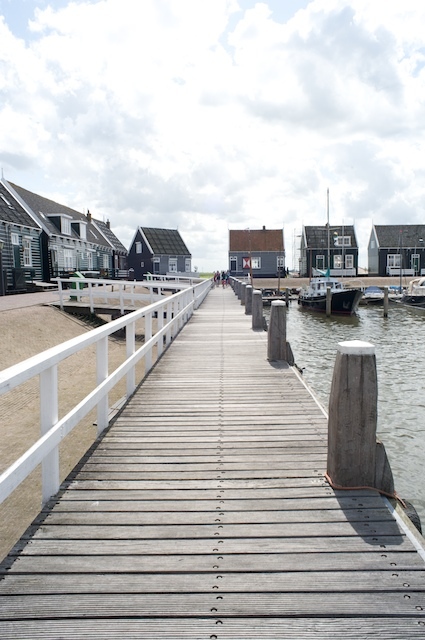 Marken was very lovely, with lots of small, old wooden houses. 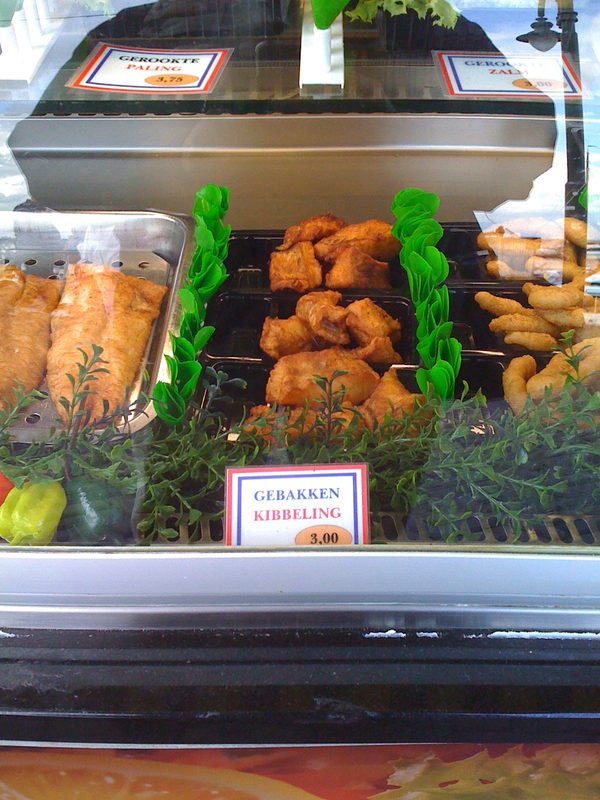 Between Volendam and Marken we had a wonderful time, and we snacked on: raw herring from a stand (which was very good), espresso and cappuccino with apple pie, gelato, shrimp in hot sauce, fried cod, called Gebakken Kibbeling, and French fries with mayonnaise. And no, we didn't get sick from all that! At about 4:30, we decided to leave Marken and take the boat back to Volendam. While on the boat, we noticed darkening clouds near Volendam, but we seemed to pass through the area, and the sun was shining when we reached Volendam. We were walking back to the bus stop, and passed a stand selling frites (French fries), and we were just a little hungry (amazing, after all that snacking), so we got a paper cone of French fries with mayonnaise (that's how the Dutch and the Belgians eat fries). We were walking back to the bus stop when the darkening clouds moved in. There was thunder and some heavy drops started to fall, and the bus passed us heading toward the bus stop. We ran as fast as we were able, loaded down with cameras, raincoats, some souvenirs that we had purchased in Volendam, and a cone of French fries! We made it to the bus just seconds before the downpour started and seconds before the bus pulled away from the bus stop. We just made it. The bus ride was relaxing and uneventful, and the bus left the rain behind (or so we thought). We got back to the Amsterdam central station, took a tram back to our hotel, and went to our room to unload and unwind. After a few minutes, Donnie said we had time for laundry, and she and I walked a few blocks to a laundromat she had located (she has built-in laundromat radar). She did the laundry while I walked a few blocks around the honky-tonk, Times-Square-like area near our hotel, looking for chocolate, licorice and wifi, in that order. I found the chocolate. During my search, the rain finally arrived. After the laundry was finished, we walked back to the hotel in the rain (with the laundry in some trash bags we had brought along), and stopped at a little French sandwich shop to get a light snack for dinner. We got back to the hotel room and had sandwiches and Orangina for dinner. An elegant end to a very fun day. Tomorrow, the prediction is for a nice day, but so far all the predictions have been completely wrong. If it is a nice day, we will go to another town, possibly Haarlem. If not, we will do some museums. We still have to see the Van Gogh Museum and Rembrandt's house. By the way, everybody here is very friendly, very helpful, and speaks perfect English fluently. 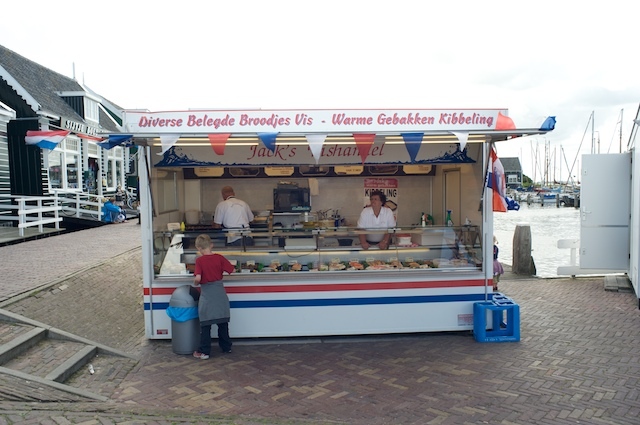 Even store clerks and food vendors who appear to be surly at first glance turn out to be very nice and very helpful. When I was struggling to get out the money to pay the bus driver, with a long line of people behind me waiting to get on the bus, he said in perfect English, "relax, relax, take your time", and smiled. I'm not sure that would happen in NYC.